We're hosting Thanksgiving dinner at our house for the first time, and as you can probably imagine, the to-do list is a mile long. Among those to-do's is to decorate the house for fall. To me, decorating for fall is one of those tricky things, mostly because the timing is weird. When's the right time to decorate, exactly? Fall kind of gets lumped into Halloween and Thanksgiving, and if you decorate for both holidays, suddenly your fall decorations might seem a little more “themed” than you intended. Like the faux leaf garlands, colorful pumpkins, and orange and red wreaths. When decorating for a timeless and modern home around the holidays, it's all about creating the feeling without going so literal, especially for fall. Since fall is such a short period of time before we get crazy with Christmas decor, I try to keep most decorating neutral and transitional. Meaning I don't have to take things down just to re-decorate for Christmas, but instead just add a few things to it. It’s already stressful time, especially if you're hosting, so this should cut down on the time you spend decorating for Christmas. And in the end, there's less stuff to store the other nine months of the year. A win-win, right? To get the look, I've gathered up a few fall to winter decorating ideas for a timeless and modern home. Look for pieces that can easily transition from fall to winter and Christmas, as I mentioned before. Forget the colorful pumpkins and corn husks, try to pick out pieces that don’t scream “fall”, but instead gives you a feeling about a season. Before you buy, ask yourself if it can transition into winter or be used in other parts of the house the rest of the year. These are always great pieces to invest in! A good example of this would be some floor lanterns or simple wreath, like a white pip berry wreath. The simplicity allows it to blend easily into fall, or winter, without anyone even knowing you didn't redecorate. I’m always a fan of neutrals, from clothes to decor, that’s nothing new. So it shouldn’t be much of a surprise that I stick to neutrals also when decorating for fall. Think cream, tan, beige, brown, etc. The color is the first thing I look for when buying holiday decor, particularly pieces that you will use year-to-year. I think this is especially key when you're decorating for a timeless and modern home. If you do want to go crazy with color, you can easily add pops of color though small accents without having to purchase all new decorations. Shocking or no? Wood is one of the easiest and most versatile ways to decorate for fall without feeling so “decorated”, not to mention it’s also is perfect for winter. From a few styled firewood logs to a beautiful organic branch in a vase, there are so many ways to pull this look off. One easy way is to take some oversized branches, with or without the leaves on them, and place them in a tall, sturdy vase or pot. Wood accents like decorative sticks or a simple branch wreath are perfect pieces that easily transition into winter because you can customize it per season with different lights, greenery, and florals! Another idea is to stack a few pieces of firewood (white birch if you're feeling fancy) next to your fireplace. Many homes these days have beautiful built-ins for firewood, but if you don’t have one, try a log loop, or even tossing a few into a sea-grass basket. Even if you’re not burning the wood, they’ll give a cozy appearance, which is what this time of year is all about. You layer your clothes as we head into fall and winter, so is it so crazy to layer your home for the fall and winter? It’s all about creating that cozy element and little details like rugs, pillows, blankets, and drapes are just what you need to do it. Since I suggested sticking with a more neutral pallet, this is where it’s fun to bring in lots and lots of texture and pattern! One simple idea is to layer a couple of rugs on top of one another. If you already have a patterned rug try adding a larger, solid rug underneath or if you have a large solid rug, try adding a vintage or cowhide rug on top. It’ll just make your space feel slightly more cozy, especially if you have hard floors. Think about the other hard surfaces in your space where people sit. Benches, ottomans, and chairs can easily be warmed up and look a little more inviting with a couple of throw blankets or small sheepskin rugs. Setting the mood is always important, and especially so in the fall and winter because we lose so much light, at least here in Seattle. Accent lighting becomes our best friend this time of year, and it also adds tons of coziness to a space. Lighting is one way for your guest to feel like they’re welcome. It’s all about creating an environment where you want to snuggle up with a blanket, a good book, and glass of wine. If you have a fireplace or some sort of indoor fire-pot, then you’re already a step ahead. Nothing beats the warm glow that a fireplace can give off. If not, that’s totally ok, too. Think about adding some large lanterns or more candles to your space. 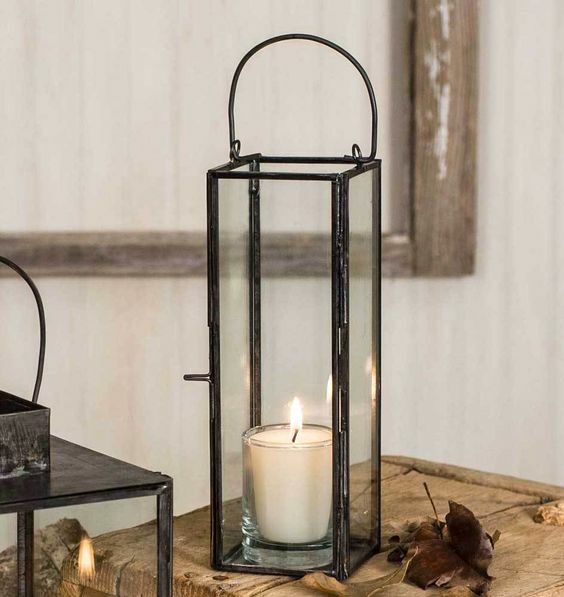 Large black floor lanterns work great outdoors in the summer on a deck or patio, but they're even better when you bring them in for the fall and winter. To achieve this look, place them in groups of two or three at various heights in small voids around your home house. Use a giant pillar candle inside the lanterns or group a few tall pillar candles together. If you don’t have lanterns, you can use some tall glass vases with decorative rocks. Goodwill is a fantastic place to find a bunch of these for cheap! There are also lighted twig trees that will look holiday-esque without feeling like an actual Christmas tree, since we're technically decorating for fall. These come in so many different heights so you can get multiples at different heights or just one larger one. For fall, place it in a pot with some floral foam and top with some moss so it looks like a houseplant.... or maybe more like house-tree. Then when Christmas rolls around, you can take it out from the pot, decorate it with a few bulbs and add a tree skirt. Sometimes when decorating for the fall, it’s actually not even about the visual decorations, but it’s about enticing your other senses. The best way to do this is with a scent. This is a total must if you are entertaining, too. There's nothing more delightful than when you go to the bathroom, and there’s a beautiful candle burning. It's really those tiny little details. One of our favorites this season has been a candle we did in collaboration with Lake Washington Candle Company called Fallen Leaves. It really embodies everything this season is about and will leave the room with a yummy fragrance. Sticking to a simple color palette, and picking pieces that can transition from one holiday to another are just a couple of ways to decorate your timeless and modern home for fall and winter. So tell me, what are some of your favorite ways to decorate for the fall? Do you usually decorate for Halloween, Thanksgiving, and Christmas, or just one or the other? Let me know in the comments below!